These arancini are baked, not fried. This makes quite a few arancini – you can either reduce the quantities or you can freeze leftover ones and then re-heat them in the oven. Preheat the oven to 200°C (fan) or 220° if it’s not fan-assisted. Toast the slices of bread, let them cool a little, then tear them and place them in a food processor with the porridge oats and a generous sprinkling of salt. Blitz them to a medium-fine consistency (not a powder, but not too big and lumpy either). Drain the mozzarella and tear into small pieces, about 1cm squared. Take a small amount of rice into your hand (use vinyl or latex gloves to stop the rice sticking to your hands). The amount will be something you develop a ‘feel’ for – you’re aiming for risotto balls that are approximately the size of a golf ball. Squeeze the risotto a little bit, to help it stick together, then make a well in the palm of your hand. Place a small piece of mozzarella into the well, close up the well and roll the risotto into a ball, ensuring the mozzarella is fully enclosed in rice so it doesn’t leak out. 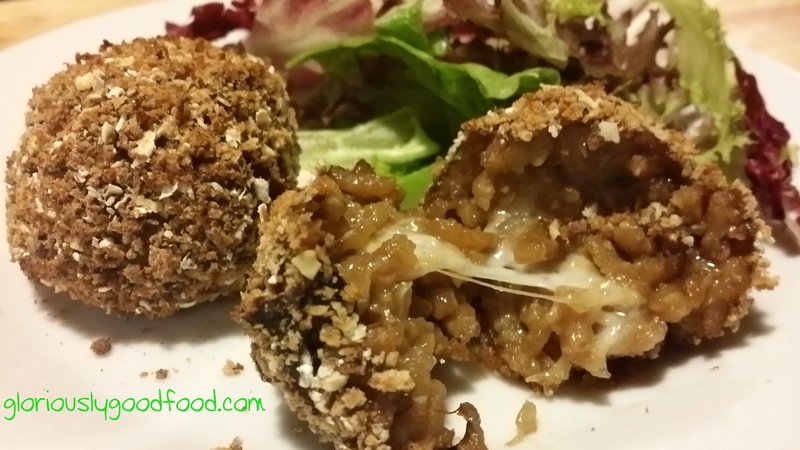 Once you have shaped a risotto ball, roll it into the breadcrumbs and place onto a non-stick oven tray. 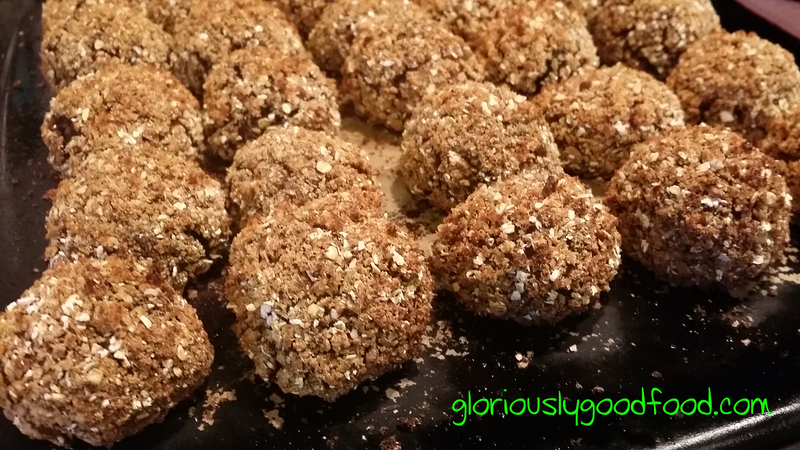 Repeat until you have made all the risotto balls (you will need 2-3 large oven trays). Spray all the arancini with 1 cal spray cooking oil and place in the pre-heated oven. Cook for 30 mins and serve – if you have them as a starter, you would typically have these on their own, but they also go nicely with a side salad. The quantities below make 8 generous portions, as I like to make lots and turn some or all of the risotto into arancini (risotto balls) – any leftover arancini can be frozen and re-heated. Soak the mushrooms for 20 mins in 1 litre of boiling water mixed with 100ml cold semi-skimmed milk. Heat the butter in a large stock-pot (cooking the risotto is even easier if you use a non-stick stock pot). Remove the mushrooms from the water/milk soak and squeeze all liquid out with your hands. Tip: Lift the mushrooms out of their soak without going to the bottom of the bowl you’ve soaked them in, as there will be lots of sediment settled in the bottom. The soak will still be very hot, so take care not to burn yourself. Wearing latex/vinyl gloves may help and will also stop your nails discolouring from the mushroom soak. Add the mushrooms to the stockpot with the butter, along with a generous pinch of salt. Keep the heat high but stir frequently to make sure the mushrooms don’t stick or burn. Meanwhile, make the stock: Strain all sediment out of the mushroom soak (water/milk), top it up with boiling water to make 2.5l of liquid and add 5 stockpots (or enough stock cubes to make 2.5l of stock). Stir vigorously for the stockpots to dissolve in the water. After a minute or so, add the rice and stir to let it absorb the butter and mushroom flavour. Stir to make sure it doesn’t stick and once the rice looks slightly glossy from the butter (should take no longer than a minute), add the stock. Pour enough stock onto the rice to cover it, stir gently and once it’s started simmering, turn down the heat to keep it simmering gently. Leave it to simmer, keeping a close eye on it but resisting the temptation to over-stir as you don’t want to break the rice grains. Top up with more stock every time most of the stock has been absorbed. Keep this going until the rice is cooked, but still with a bit of bite (‘al dente’). This should take approximately 20 minutes, but as rice is a natural ingredient, how long it takes and much stock you end up using is variable. Make sure the risotto isn’t too dry at the end (so add very little stock each time as you’re nearing the end of cooking). You want it to be slightly wet as it will absorb more as it stands and, when you add the parmesan, this will also make it drier. 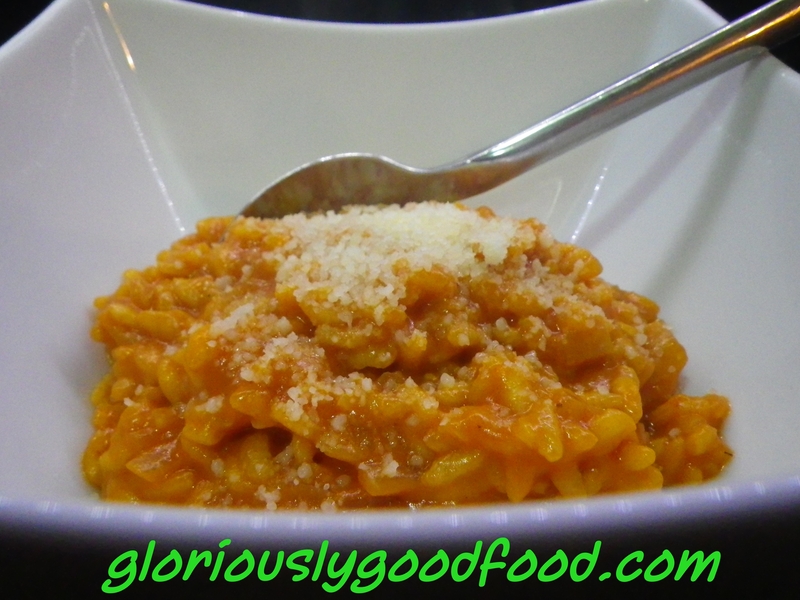 Stir in the grated parmesan and leave to stand for a few minutes before serving. For those not on a low-fat diet / reflux diet, you can serve this with more parmesan to grate onto each dish at the table.